Winners of the second part of the Naamah's Kiss “Kissing Contest” were announced earlier in the week. I still have not heard from KalidaViraga. Please contact me at scifiguy(at)scifiguy.ca with your shipping information. If I have not heard from you by the final draw on June 25 I will draw a new name. Remember the Namaah's Kiss “Kissing Contest” continues until June 25 with 1 more copy remaining to be given away, so everyone's name is still in the hat. Contest details here. My next guest is Rachel Vincent, who will be here on July 1 to talk about her fourth Shifters book Prey (which I finished last night and it is terrific – the best so far) She will also be popping in to answer questions , so drop in, say hi and leave a comment or question. My Blog 2.0 has a giveaway for a copy of Diana Rubino’s latest release, a time travel romance novel, Traveling Light. Open until June 24. Unmainstream Mom Reads is giving away 3 copies of Santa Olivia and Naamah’s Kiss by Jacuqeline Carey. Contest runs until July 4. Alpha Heroes has 5 copies of Naamah’s Kiss to give away. Contest ends June 23rd. Rachel Vincent has a signed copy of Prey and the necklace Faythe wears on the covers of Rogue, Pride, and Prey, described by the manufacturer (Guess) as a, “silver-tone chain link choker.” Contest ends June 23rd. Drey’s Library has a giveaway for Urban Shaman (Walker Papers #1) by C.E. Murphy. Ends 6:00 p.m. CST June 25th. Popin’s Lair has a giveaway of Bloody Good by Georgia Evans. Giveaway ends on June 30. P.C. Cast has a contest for a signed set of the House of Night books, tee shirts, and jewelry. Marta Acosta in her newsletter says her new book is a romantic comedy, which will come out in June 2010, and centers on Nancy Carrington-Chambers, Milagro's best friend from Fancy University. Nancy attempts to get her party planning business off the ground, but things go wildly awry. Milagro makes a few appearances in the story, because I have way too much fun writing Milagro/Nancy dialog. Jocelyn Drake tells us that if you are a member of the Science Fiction Book Club, they will be releasing an omnibus version of Nightwalker and Dayhunter in July. If you would like both books combined in a single, lovely book, hop over there as soon as possible and get your copy. Marjorie Liu also reveals that she is also contributing a Hunter Kiss novella to the recently announced anthology Inked for January 2010. Here is the book trailer for Annette McCleave’s debut paranormal romance Drawn into Darkness coming September 1, 2009. Annette will be guest posting here in August. Here’s the book trailer for the upcoming Night’s Cold Kiss by Tracey O’Hara. Dakota Cassidy (the Accidental series paranormals) is chatting with The Knight Agency Thursday, June 25th @ 9pm ET about her newest release Kiss and Hell. Lots of giveaways planned for the chat. Details here. Jennifer Rardin is publishing online a mini-mission for Jaz. Parts 1-4 of Scouting Jasmine have been posted here. Part five will be up Monday. New UK cover - CARPE CORPUS from Rachel Caine . She also says that her U.S. publisher (NAL Jam) is going to put out a special trade paperback omnibus 2-in-1 edition of GLASS HOUSES and THE DEAD GIRLS' DANCE, in November, to coincide with the release of FADE OUT. Lynn Viehl says Lara Adrian’s publisher Random House, has put up Kiss of Midnight, the first novel in her Midnight Breed series, for free download in .pdf, Kindle and Sony formats. If you'd prefer to read it online, you can find it at Scribd here. Anna’s Book Blog featured some new covers including Christine Warren’s Big Bad Wolf (The Others #8 - an extended version of the ebook Fur Factor) coming September 29, 2009 and Hunter’s Need (Hunters Book #11) from Shiloh Walker coming December 1, 2009. 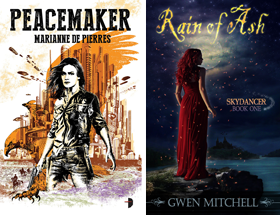 Seanan McGuire has posted an impressive list of current projects on her blog. 15 Worst Romance Opening Lines via OCD, Vampires, and Rants, oh my! Chloe Neill (Some Girls Bite/Friday Night Bites) has a fun guest piece over at John Ottinger's Grasping for the Wind today called The Significant Other's Guide to Dating a Science Fiction/Fantasy Writer. Good stuff! There is also a 4 item giveaway for - a signed copy of SOME GIRLS BITE, an "I Heart Cadogan" bumper sticker, a Cadogan House bar coaster and a SOME GIRLS BITE magnet. Contest closes June 27. New cover art this week - Embers by Laura Bickle. Here is an extended preview of the Vampire Diaries debuting this fall on Thursdays at 8 p.m. ET/PT. 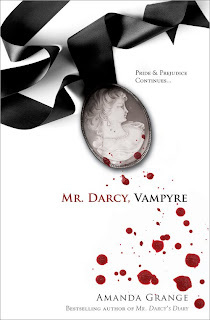 NAPERVILLE, IL (June 10, 2009) — Sourcebooks Landmark, the leading publisher of Jane Austen-related fiction, is excited to announce a major release in the category: Mr. Darcy, Vampyre by international bestselling author Amanda Grange. Amanda Grange’s style and wit bring readers back to Jane Austen’s timeless storytelling, but always from a very unique and unusual perspective, and now Grange is back with an exciting and completely new take on Mr. Darcy and Elizabeth Bennet in Mr. Darcy, Vampyre. Sourcebooks has announced an on-sale date of August 11, and a 75,000 copy first print run. Mr. Darcy, Vampyre sounds very interesting. Kinda funny too, how the Zombie version of Pride and Prejudice was released not too long ago, and now Mr. Darcy, Vampyre is coming out. I'll definitely check this one out though, I may like zombies but vampire fiction is one that I love. Thanks again for recapping what is going on and thank you for linking to my giveaway! Thanks for linking to my book trailer. And isn't Vicki just lovely. I love this showgirl 101 promo and she will be speaking to Kim Harrison on The Beyond Author Radio Channel July 2. PopinFresh, I suspect I might enjoy this one over the Zombie version, but than I haven't read Pride and Prejudice and am sure I would miss all the finer nuances. Hi Tracey, your book looks terrific so it's my pleasure. And thanks for the heads up on Vicki's radio appearance! Thanks for posting my trailer, too. I'm looking forward to guest blogging in August. Hi Annette your trailer has a great mix of intriguing images and music. Very nice. Looking forward to August too! Fixed the link - thanks for letting me know. Thanks for the all this wonderful info. :) More books to add to the list and lots of fun stuff as well. Michelle I love zombie movies to begin with but a zombie satire is even better. This is so over the top it promises to be good no matter how bad it may be.